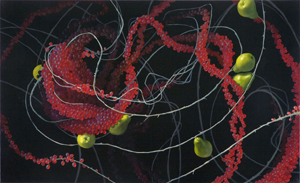 Mia Brownell paints intertwined clusters of ripe fruit spiraling in meandering structures suspended in space. Employing dramatic chiaroscuro, Brownell's still-life fantasies simultaneously reference Dutch Old Master paintings and the coiling structures of DNA, amino acids, and protein chains. This piece comes from the series Proteomics, a word that refers to the study of proteins expressed by genes within an organism, with applications in the understanding of disease and in drug development. Art historian Donald Kuspit describes this series as "standing between the supermarket and the museum in the commercial cornucopia of modern America and in the grand tradition of Old Master still life." Brownell takes a long-established genre, considered minor in the modernist canon, and serves up a meditation on the genetic modification of food, inviting us to celebrate and wonder at the rapturous beauty and poignant fragility of nature. Born in 1971 to a sculptor and a biophysicist in Chicago, she now lives in New Rochelle, N.Y., and teaches studio art at Southern Connecticut State University.